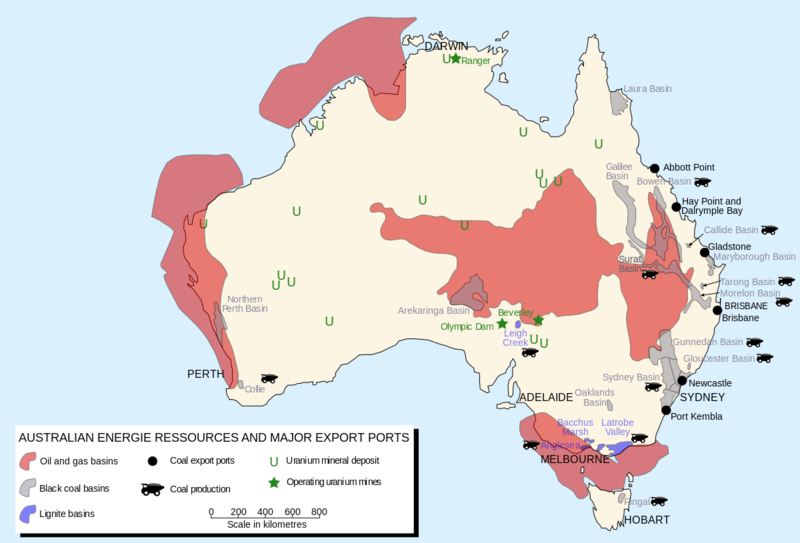 The Clean Energy Target as proposed by Chief Scientist Alan Finkel will be overhauled and replaced with a policy that will place much greater emphasis on coal-fired baseload power and possibly a slower transition to renewable energy. At the same time, energy regulators and industry sources suggested there was no need to prolong the life of the Liddell Power Station in NSW and that energy shortfall created by its closure in 2022 could be met by other means. AGL chief executive Andy Vesey told the government this during and after Monday’s meeting in Canberra at which he was pressured to sell Liddell or keep it open, rather than close it in 2022 and replace its generation capacity with gas and clean energy sources. “The best way to address pricing challenges in the market is to increase supply. We’re investing more than anyone else in building new supply to drive down prices and stand ready to invest more when there is certainty on carbon policy,” Mr Vesey said. Labor leader Bill Shorten concurred. “How can the government expect industry to decide on new generators if the government can’t even decide on a Clean Energy Target?” he said on Tuesday. But the government all-but confirmed on Tuesday that it had moved away from plans to implement a CET and will instead unveil a policy which places a heavier emphasis on cheap and reliable power. Energy Minister Josh Frydenberg said last week’s report by the Australian Energy Market Operator which highlighted an intermediate-term shortfall in baseload power if Liddell closed in 2022 had “reset the debate” and “placed a focus and a premium” on baseload and stability. Mr Turnbull told Parliament “the real challenge to the reliability of the energy system is the failure of the current market system to take into account the importance of having baseload power”. “We need to ensure that the energy market design provides a suitable framework for investment that doesn’t simply get new generation, but gets generation of the right kind,” he said. Mr Turnbull insisted there could be a policy which kept coal burning longer but still enabled Australia to meet its 2030 emissions reductions targets. 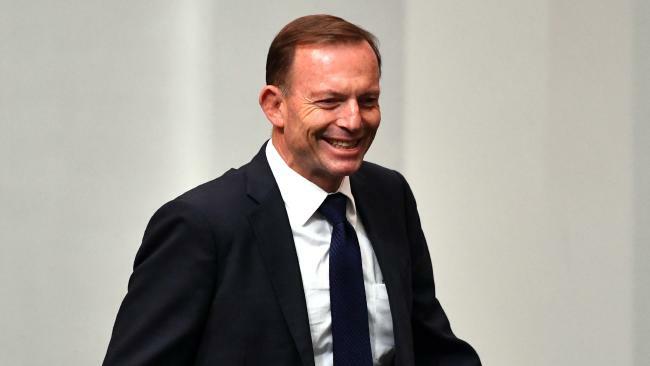 The shift was welcomed in the Coalition party room by Tony Abbott. He congratulated Mr Turnbull and warned there should not be a CET bolted on top of the existing Renewable Energy Target. Malcolm Turnbull is facing a backbench push to stop a clean energy target being embraced as government policy, after former prime minister Tony Abbott fired a warning shot on the political risk of adding the new scheme to existing subsidies for renewable power. The Prime Minister yesterday played down the need for the target as he attacked Labor over energy prices and reliability, putting a priority on affordable power rather than cuts to carbon emissions. A solid group has formed within the Coalition party room to oppose a clean energy target out of concern it would push up prices and weaken the security of supply because it would favour renewables over coal or gas generators. The substantial minority is opposed to a clean energy target of any kind and appears unlikely to be satisfied by a scheme that offers small financial incentives for gas-fired power or the most advanced coal-fired power stations. Mr Turnbull and Energy Minister Josh Frydenberg have scaled back talk of a clean energy target while urging power company AGL to keep running its Liddell coal power station beyond its scheduled closure in 2022. In a pointed intervention yesterday, Mr Abbott welcomed the talks with AGL on extending Liddell but warned against adding the clean energy target to the existing renewable energy target, which decrees that 23.5 per cent of electricity comes from renewables by 2020. “If we graft a CET on top of the existing RET, that will be a difficult position to sustain,” Mr Abbott told the party room. He later told The Australian that the nation had enough renewable energy in the system and should build new coal power stations because existing plans, such as the expansion of the Snowy Hydro scheme, would not be enough to make up for the closure of the Hazelwood coal power station in Victoria earlier this year. “We are already slated under the RET to effectively double the amount of wind power in three years,” Mr Abbott said. “We would be better off saying no more subsidises for renewables. Mr Abbott said it was inevitable the government would have to fund new coal. “The government will have to do it. The same way we are doing Snowy 2.0 we will have to do a new coal-fired power station,” Mr Abbott said. New study reveals that global CO2 emissions intensity growth exceeded 37 of all 39 IPCC scenarios – including all 6 main scenarios – over the decade 2000–2010. The wide spread of projected temperature changes in climate projections does not predominately originate from uncertainty across climate models; instead it is the broad range of different global socio-economic scenarios and the implied energy production that results in high uncertainty about future climate change. It is therefore important to assess the observational tracking of these scenarios. Here we compare these socio-economic scenarios created in both 1992 and 2000 against the recent observational record to investigate the coupling of economic growth and fossil-fuel CO2 emissions. We find that global emission intensity (fossil fuel CO2 emissions per GDP) rose in the first part of the 21st century despite all major climate projections foreseeing a decline. Proposing a method to disaggregate differences between scenarios and observations in global growth rates to country-by-country contributions, we find that the relative discrepancy was driven by unanticipated GDP growth in Asia and Eastern Europe, in particular in Russia and China. The growth of emission intensity over the 2000s highlights the relevance of unforeseen local shifts in projections on a global scale. The wide spread of projected temperature changes in climate projections does not predominately originate from uncertainty across climate models; instead it is the broad range of different global socio-economic scenarios and the implied energy production that results in high uncertainty about future climate change. While the physical-science basis of models used in Intergovernmental Panel on Climate Change (IPCC 1990–2013) reports is very much the focus of the debate in climate research, the underlying socio-economic scenarios that determine emissions of greenhouse gases have received comparably less attention. Observations over two decades are now available against which the initial sets of socio-economic scenarios underlying the IPCC reports can be assessed to study the observational tracking. Here we compare these socio-economic scenarios created in both 1992 (IS92 – see Refs. [12,20]) and 2000 (SRES – see Ref.17]) against the recent observational record to investigate the coupling of economic growth and fossil-fuel CO2emissions. 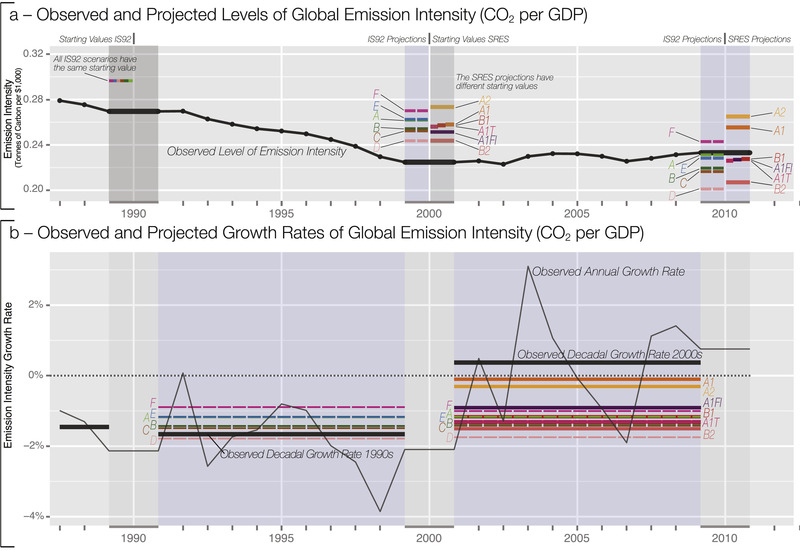 We find that global emission intensity (fossil fuel CO2 emissions per GDP) rose in the first part of the 21st century, despite all major climate projections foreseeing a decline. Studying the differences between projections and observations we find that the relative discrepancy was driven by unanticipated GDP growth in wider Asia, particularly in Russia and China. The growth of emission intensity over the 2000s highlights the relevance of unforeseen local shifts in projections on a global scale. An election seen partly as a referendum on Norway’s future as an oil-producing country went solidly for the status quo. Prime Minister Erna Solberg of the center-right Conservative Party and her main collation partner, the Progress Party, won 89 seats in Norway’s 169-seat Parliament, defeating a group led by the Labor Party that was projected to win 80 seats. Before the election, weakening of the Labor coalition was thought to have created an opportunity for the Green Party to gain influence. The Greens campaigned to halt oil and gas exploration and to phase out the Norwegian oil industry in 15 years. But the party only retained its single seat, winning an estimated 3.3% of the vote. No Conservative-led Norwegian government has retained power in an election since 1985. The Labor Party was projected to lose 6 of its 55 seats but to remain Norway’s largest single party. The research shows that every 10 years, Uttarakhand and Himachal Pradesh glaciers were melting at 6% and 5% respectively, while glaciers of J&K were stable. The reason is that Uttarakhand and Himachal glaciers are dependent on Indian summer monsoon system, governed by oceanic currents and changes in solar energy. On the other hand, glaciers of J&K are dependent on winter precipitation mainly in the form of snowfall, which has lesser impact on glacier volume. If you have not already done so, you can sign up to the GWPF newsletter here. Right, thanks Magoo. I was meaning to get this up already, but we’ve had visitors and I’ve been pressed for time ahead of Bill English’s visit to Te Puke in about an hour. How often do we read that climate-science sceptics are anti-science right-wingers? Perhaps this article by Graham Stringer – a British Labour MP and Member of the Commons Science and Technology Committee – will give some folks pause for thought. The UK press regulator, the Independent Press Standards Organization (Ipso) has now upheld a complaint submitted by Bob Ward of the London School of Economics. Ipso ruled that the Mail piece “failed to take care over the accuracy of the article” and “had then failed to correct these significantly misleading statements,” and the Mail on Sunday was required to publish the Ipso adjudication. And of course the paper itself had undergone rigorous peer-review prior to its publication in one of the world’s most highly-regarded scientific journals, Science. All signs pointed to the Noaa data and paper being based on sound science that had been reproduced and verified. But that didn’t fit the preferred denialist narrative of Rose and the Mail on Sunday, so they weaved a conspiracy theory that then reverberated through the right-wing media echo chamber. Rose’s story seemed to have all the climate denial components that biased conservative media outlets crave. A lone wolf scientist whistleblowing his former colleagues with accusations of data manipulation for political purposes? Despite the glaring errors in the story that were immediately called out by climate scientists and reputable science journalists, this narrative proved irresistible to the conservative media: Breitbart, Fox News, Drudge Report, Rush Limbaugh, The Daily Caller, The Washington Times, and more ran with Rose’s story. Meanwhile, legitimate news outlets like The Guardian, The Washington Post, Carbon Brief, E&E News, Ars Technica, Science Insider, RealClimate, and numerous other science blogs quickly debunked Rose’s falsehoods. The errors really aren’t surprising. Rose and the Mail have a long history of climate denial, including error-riddled stories on Arctic sea ice, Antarctic sea ice, human-caused global warming, even the very existence of global warming. And the Mail has such a long history of inaccuracies in general that Wikipedia editors consider it an unreliable source and banned its use. But Breitbart, Fox News, Rush Limbaugh, and other right-wing media outlets have no qualms with publishing inaccuracies from unreliable sources, as long as the story advances their climate denial agenda. The scientific evidence is crystal clear that human-caused global warming is very dangerous. People who want to maintain the status quo that favors fossil fuel companies, who oppose climate policies that disrupt that status quo, need to somehow discredit that reality. They can’t argue the science, about which there’s a 97% expert consensus, so they instead attack the scientists themselves. They accuse these scientists – who have devoted their careers to bettering our understanding of the workings of Earth’s climate – of fraud, conspiracy, and manipulating data for nefarious purposes. Their goal is to manufacture doubt. Usually they get away with it. This time the Mail on Sunday’s “significantly misleading statements” were so bad that they were censured, though not before they had misinformed millions of people. However, the Ipso ruling tells us which media outlets are reliable sources on the subject of climate change. Those that blindly echoed David Rose’s misinformation are not; those that debunked the Mail on Sunday’s distortions are. No doubt suits the con government to have a climate science denier on board. there may be no such thing as a greenhouse gas. [ Allmendinger 2017, pdf ]. 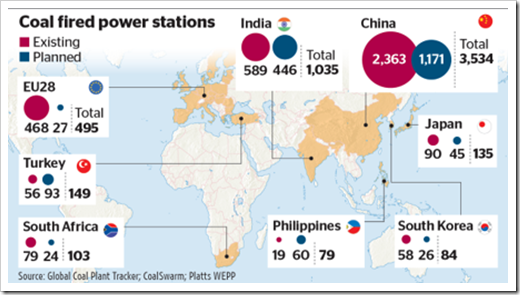 Are Svante Arrhenius, the IPCC and all their entourage wrong? Thomas Allmendinger certainly thinks so.